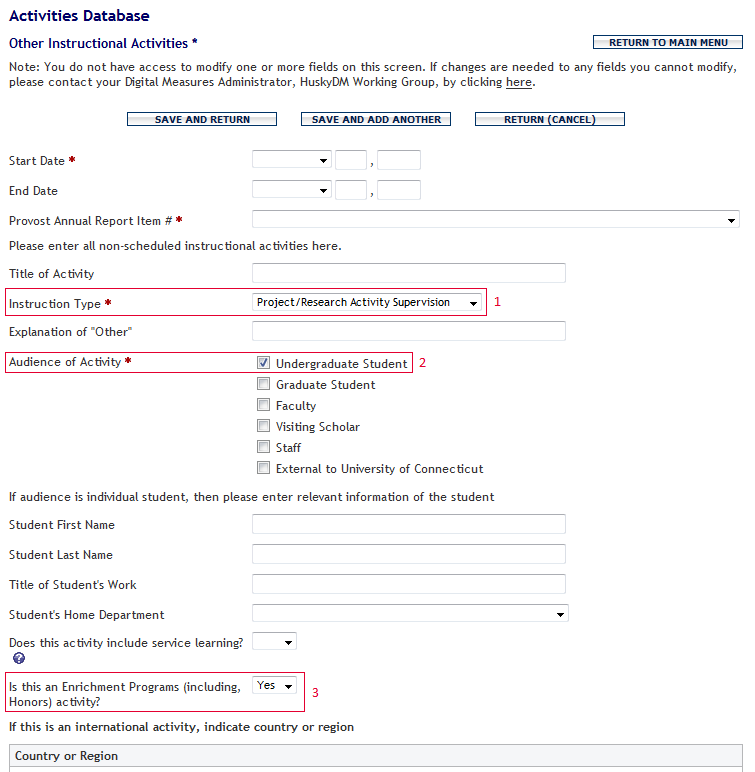 HuskyDM is the data repository and reporting tool for UConn faculty. The HuskyDM system captures teaching, research, and service activities, including mentorship of undergraduate research. Accurate faculty reporting of supervision of undergraduate research, scholarship, and creative activity within HuskyDM will allow us to compile a more comprehensive and accurate picture of faculty-mentored undergraduate inquiry at the university. Navigate to the Teaching section, then Other Instructional Activities. Within Other Instructional Activities, click the Add a New Item button. 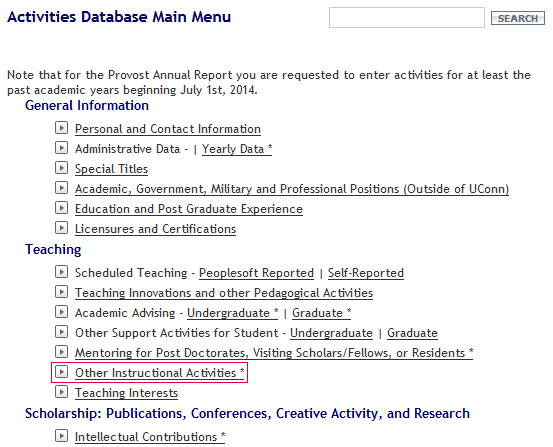 For Instruction Type, select Project/Research Activity Supervision from the drop-down menu. For Audience of Activity, select Undergraduate Student. If the project was supported by the Office of Undergraduate Research, please indicate Yes in the drop-down menu associated with the question, Is this an Enrichment Programs (including Honors) activity? You can also use this designation for other activities associated with Enrichment Programs, which include Honors, the University Scholars Program, and the Individualized and Interdisciplinary Studies Program. Once you have saved an item under Other Instructional Activities, you will have the option to copy it (as illustrated below), which can streamline the process of creating additional, similar items. 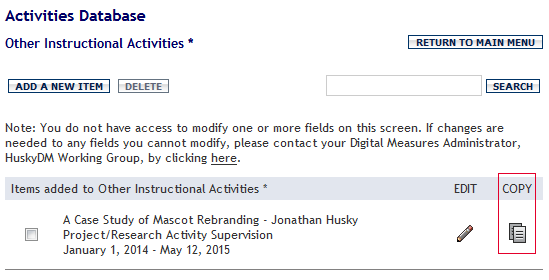 The HuskyDM system is administered by the Office of Institutional Research and Effectiveness. Further information about HuskyDM, training, and user guides can be found on the HuskyDM website.